Grey Heron (Ardea cinerea Linnaeus, 1758) belongs to the order of Pelecaniformes and to the family of Ardeidae and is the most widespread heron in the old Continent as well as the larger in size among all the European species. In considerable decrease in the second half of last century it is having in the last decades a remarkable increase in all its area. Particularly in the Po river basin, favored by the presence of spring water that does not freeze in winter time, we are observing a wider and wider diffusion and a multiplication of their presence even during the cold season when, migrant populations coming from north, use to stop to winter. 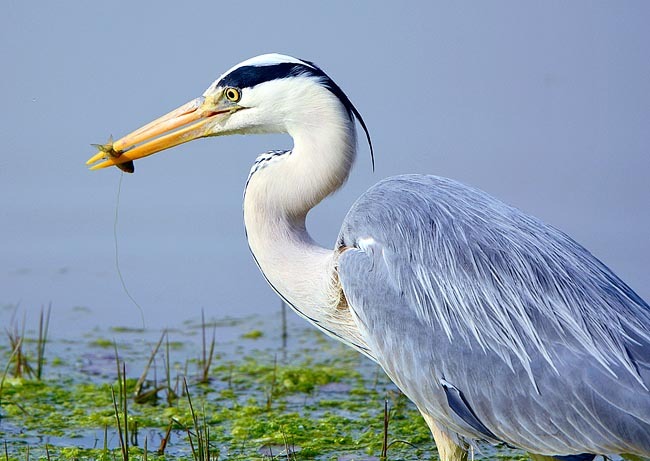 It is useful to remember that introduction of an alien species such as the Louisiana crawfish (Procambarus clarkii) that found in northern Italy’s waters a real paradise, has helped a lot the increasing of the population of this heron as it has become its main prey. 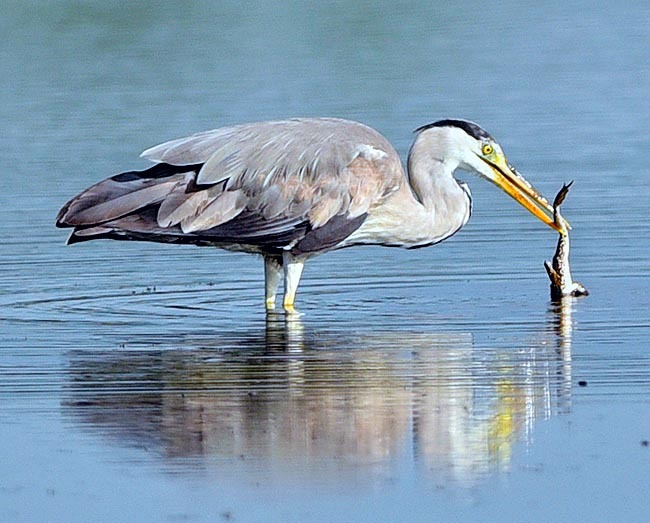 Grey heron has an incredibly perfect weapon of deadly result: the bill. As a real dagger of more than 20 cm long, extraordinarily pointed and strong, placed on a long and flexible neck that acts like a spring ready to go off at needs and that does not forgive when directed to the selected prey. Extremely cautious in its movements as if moving in slow motion, busy at focusing its preys with its very big eyes, grey heron can remain motionless awaiting some games even for many minutes without turning a hair. Then, suddenly as soon as it sights the victim, there it draws for few centimeters its neck and hits inexorably the chosen prey. A relentless hunter that does not forgive. 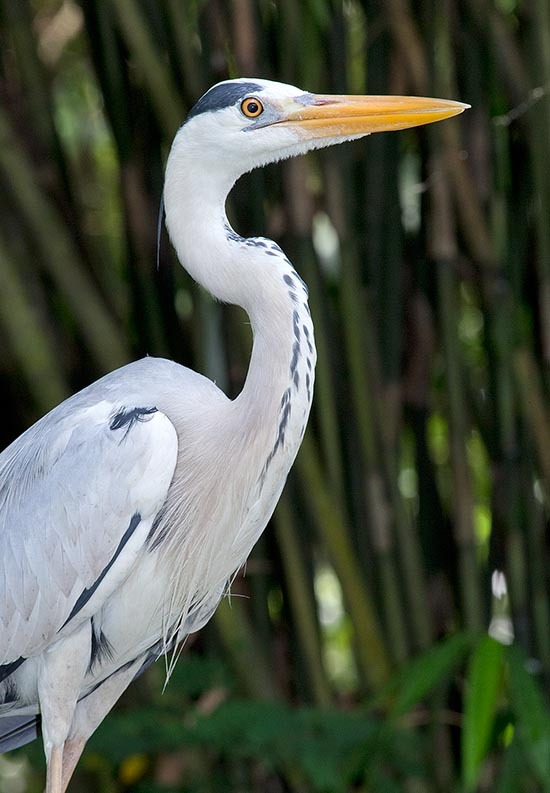 The etymology of the scientific name comes, for Ardea genus, from the ancient Roman mythology. Ardea the today’s town of Lazio was at the time the capital of the Rutuli people that was razed and completely burnt. From its ruins revived a big bird that after having uttered a long cry and shaken the ash that totally covered its wings, it showed itself to be pure white. Perhaps a direct connection with the Phoenix legend. The etymology of the species cinerea comes from the Latin “cinereus”, after the grey bluish colour of its plumage. Some common names given in Europe: in english Grey Heron; in french Heron ceindré; in german Graureiher; in spanish Garza Real and in portoguese Garça-real. 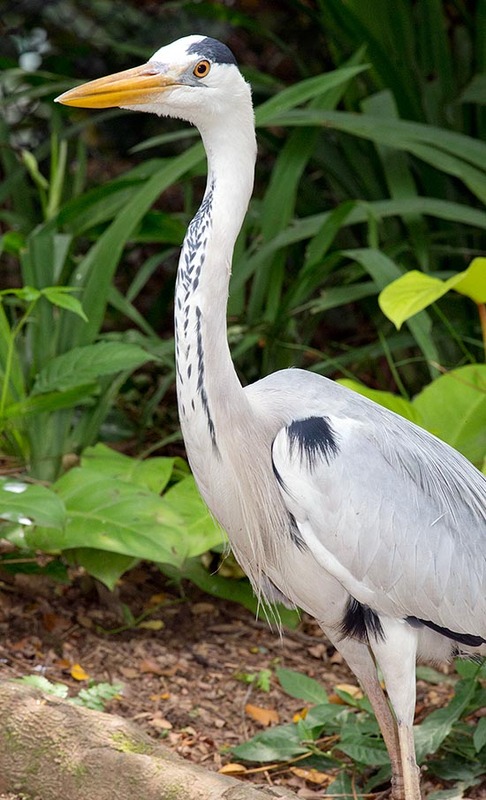 The grey heron is original from Eurasia and Africa where it is very common and widespread. Although tied to temperate and tropical areas, its territory spreads out very north till to reach on the European side, the extreme northern coasts of polar circle and on the asian side, the Siberian coasts of the Pacific ocean. In the southern Asia it occupies the tropical side of the indian and indochinese peninsulas arriving till Java and Sumatra. In Africa it lives everywhere apart the saharian belt. A migrator in the temperate and cold areas, it is on the contrary resident in tropical territories and in those regions where winter weather conditions do not reach situation of extreme severity. In these areas we see populations overlapping with strong concentrations that often bring competitors to a struggle for food and a real fight for survival. Also long periods of winter drought, with disappearance of water streams on which they depend for food and sudden turning frost, bring to a real decimation of their number. Very common in northern Italy due to the presence of spring waters that hardly get frost during cold season, together with strong manureing with organic residuals coming from pig and cattle breeding that often flow in water streams and that have modified the biological structure of the superficial flowing waters, have helped not only to strengthen the number of these birds which were decreasing in the last decades but also to create the conditions to absorb greater populations. It is not rare to see, in winter time, some large flocks of grey herons standing in the stubbles and meadows of the river Po basin. Northern populations are strong migrators and carry out migrations of several thousand km to reach winter areas. In Africa the migration is midcontinental and is influenced by meteorological situations due to raining season alternation. Four subspecies have been classified as per specific areas occupied. L’ Ardea cinerea cinerea of Europe, Asia and Africa Ardea cinerea firasa of Madagascar and closer islands, Ardea cinerea jouyi of Korea, Japan and Indonesia and Ardea cinerea monicae of sandy beaches of Banc d’Arguin in Mauritania a very important site for birds endemisms. In the Americas this species is replaced by the great blue heron (Ardea herodias) very similar in the appearance but larger in size that shows a plumage more blackish on the breast, with reddish wing borders and ochreous thighs. By now, grey heron is common every- where, from sea coasts up to 3000 m on the asian and african uplands. At the time it was just a typical dweller of marsh lands, of humid areas with any kind of water streams, of stubbles and meadows, of dry spots rich of preys, of shrubby sites covered by tall grass, but now it is not rare to see it walking around park fountains or standing stiffly by a city fisherman along the Seine quays in Paris or along the Amsterdam canals waiting for a small fish to steal when caught, taking away from the legitimate owner with unimaginable capability. It is perfectly known by the owners of the pretty tiny ponds created in their small gardens to guest those four red fishes at time kept home and now become the night larders of these birds. Suddenly in the morning, here disap- peared all small fishes, the few tiny frogs that use to live around there, the dragonflies and tadpoles that happily wallow in the pond the evening before. Not to forget the fish breeding farm that have faced decuple costs for protection of their nurseries from these night robbers. Grey heron eats everything and practically catches anything crosses its sight. For this reason it has become, from this point of view, one of the most fierce predator of water birds nests and of any other terrestrial bird as well rodents, insects, frogs and toads, snakes, fishes, crustaceans, shellfishes and, particularly in northern Italy, of the Louisiana crawfish (Procambarus clarkii). As concerns water birds, it is believed that a strong percentage of the loss of chicks of ducks, moorhens, coots and other herons, is due to its presence. Moreover it does not disdain eggs stolen hopeless from nests that it finds during its careful search. Prey is usually grasped by the bill but in case of big targets like moles, rats or large fishes it is usually harpooned and pierced by the terrible bill and later swallowed with capability, after spectacular aerial throws. Searching for food involves long trips sometimes at tens of km distance from the nesting site or its place usually occupied. Its flight is slow and easy, with very few but very powerful and mighty wing-strokes, result of the remarkable wing surface and remiges that in the primaries can arrive at 40 cm length. Grey heron is a remarkable size bird reaching easily one meter length, 170 cm wingspan and a weight that can vary, according to food availability, from 1 to 2 kg. Livery of the cover, as per its scientific name, is ashy bluish, with a long neck, white in front and spotted with black on the throat, that take up over 40% of total length. Legs, also them very long, are ash yellowish coloured and fitted with long and sturdy fingers strongly clawed, suitable either to paddle in muddy waters or to tighten small branches when sitting on a tree. The lower part of its body is white and embellished, when in nuptial plumage, with long e thin feathers like aigrettes. The forehead is white with two large black eyebrows that go down along the nape creating a cap well evident from afar together with a long tuft of very black feathers, more than 20 cm long. The bill is completely yellow, pointed, very long and sharp, a real and very dangerous knife used with skill and that can be of incredible dangerousness for everybody who gets close. Very big eyes, like an owl, with a sparkling yellow straw-coloured iris. Being a bird with both day and night activity, it takes advantage of the night as one of the best moments for hunting and migration, helped by its remarkable capability to see in the dark. Youngs, very similar to adults in the winter livery, have in its puberty period a more speckled and less evident colouring. Typical in all herons, when flying they keep tucked-in neck. Grey heron is a very early nester and from the end of January you can observe it sitting on eggs. Sometimes in particularly unfavourable seasons, it is possible to see birds sitting on the nest covered even by snow. Usually it starts nesting during first months of springtime but there are cases of nesting even at the end of May, possibly in substitution of a lost clutch. 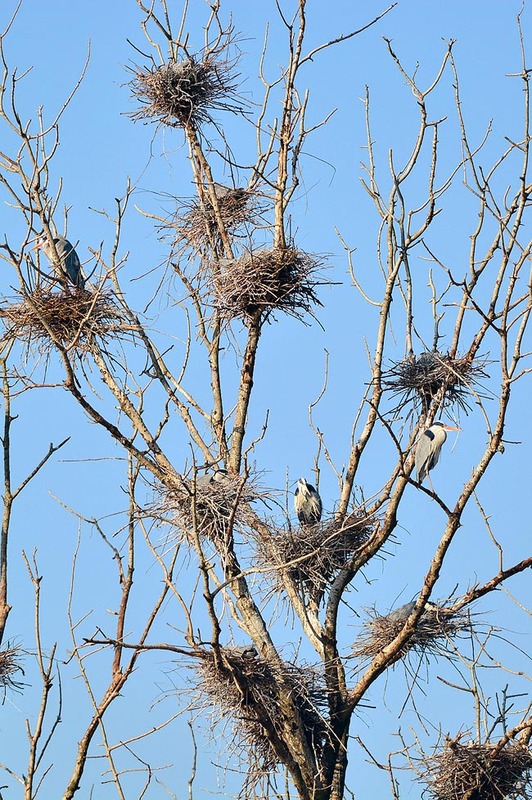 It nests in heronries with colonies sometimes very crowded and often mixed with other herons with which shares the territorial defense. Distance between nests is often very short and practically it can be measured summing the length of the competitors necks. Heronries are usually located in areas not reachable by surface, as islets in small lakes or in abandoned caves, in the middle of a bed river or often among rice fields or cultivated areas and placed on big trees usually bare and dried up that later fall down and sometimes making disappear colonies who were large and prosperous since long time. On the other hand heronries can be enormous and count hundreds of pairs and last even for decades, colonizing continuously new trees and new positions. Nest is usually located very high on side branches but sometimes may be built even in reedbeds below when heronry is very large and landing availability reduced. Nest is a bulky stick structure even of large dimensions later covered with foliage and softer linings. Nest can be re-used for several years refurbished every season with new material. During mating season herons play a strict courtship, noisy and very choreographic. Neck swingings with wings opening and false starts not only to show the great wingspan but also for staying in balance as these operations are carried out staying on the nest or close branches. For sure it is not easy for such a huge bird make acrobatics on small and not safe branches located at some tens meters from the ground and also so close to other couples that are trying to do the same play. All is associated to ungraceful and guttural sounds that let the whole heronry, audible from afar before to be sighted. Actually these places are easily found for this particular feature. Grey heron is the most vocal among all herons and also outside the nesting period it utters this unpleasant croak in every moment of its life. Even during its long journeys to find food as well as during migration, it continuously utters this sound just to keep in contact with its fellows. It lays usually 4 bluish eggs, very small compared to its body size, brooded for 4 weeks by both parents. Nestlings stay in the nest for a long time up to 7 weeks, after that they start to climb outside on the closest branches till they can fly. 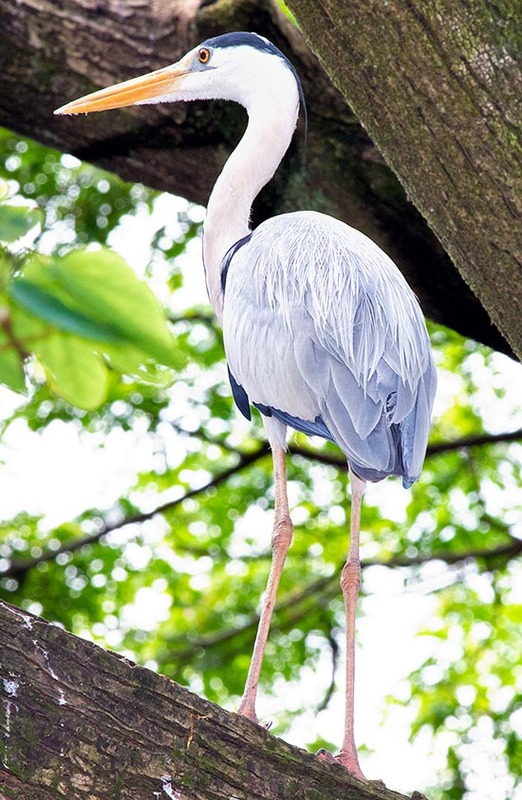 During this period young heron is often victim of falling and easy bite for predators that well informed about this fact, wander at the base of the heronry. Nestlings feeding at the nest is done by regurgitation of the food kept in the adult’s crop, collected and carried sometimes from impressive distances. 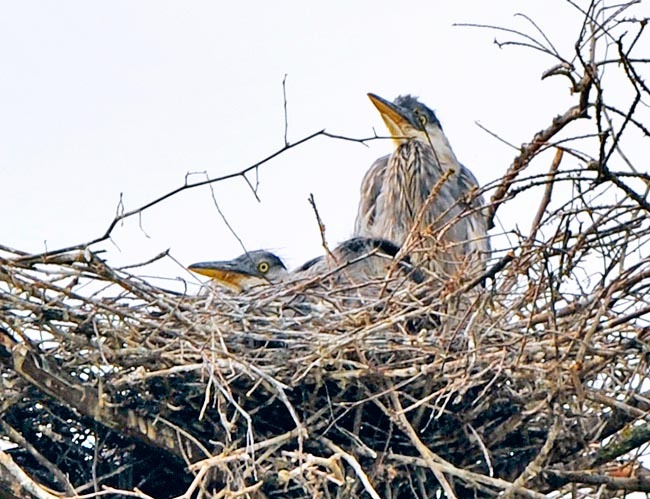 Mortality of grey heron nestlings is very high and can overcome 70% of young population however it is a very strong animal when reaching the adulthood, even living an age of 20. In any case in particular meteorological situation this condition seems to be impossible and the lifespan expectation of these birds decrease dramatically to few years. 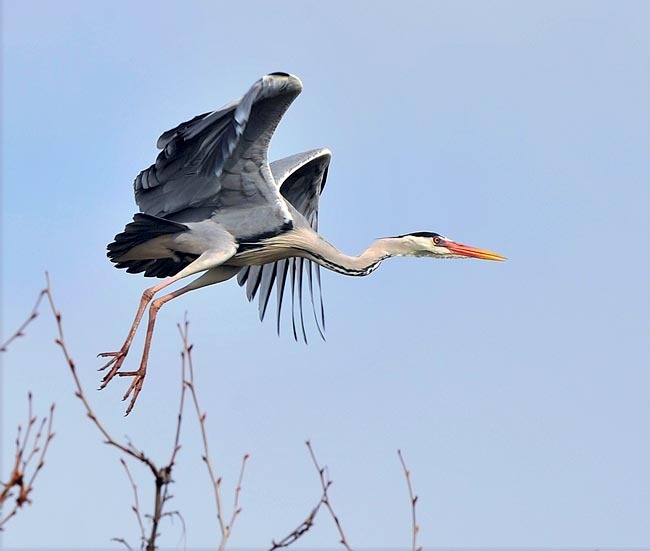 However grey heron is considered a bird with a strong and negative economic impact on human activities, due to its fondness for any fish breeding sources. Besides we must add the damage often done to game breeding farms devoted to hunting purpose, for which reason often is victim of some illegal gunshot. Grey heron is by the time a very common bird, with strong and substantial populations that does not put any problem in its evolution and for this reason this species is not considered at risk.